Cutting-edge research in the neurobiology and physiology of empathy led to the development of our education program called E.M.P.A.T.H.Y. It has been rigorously tested in a randomized controlled trial at Massachusetts General Hospital. The education resulted in significantly improved physician empathy, which in turn increased patient satisfaction scores. (Riess et al, 2012) This clinical study demonstrated that empathic skills can be learned and enhanced. The education has been presented to over one thousand physicians. Once learned, the skills can easily be incorporated into a clinician’s daily routine, improving all interpersonal communications. 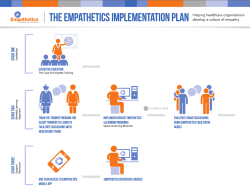 Learners at hospitals, medical malpractice insurance companies and health plans are benefiting from Empathetics education. 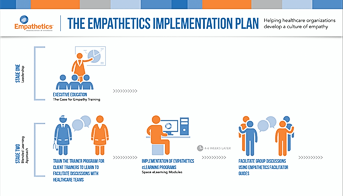 For more detailed information about the Empathetics experience, please click on the Empathetics roadmap to learn how to develop a culture of empathy at your institution.